James Allen Otto (born July 29, 1973) is an American country music artist who is a member of the MuzikMafia, a group of country musicians known for their "country music without prejudice". Otto began his career on Mercury Nashville Records in 2002, charting three minor singles on the Billboard Hot Country Songs charts and recording his debut album Days of Our Lives for the label before being dropped in 2004. In late 2007, he signed to Warner Bros. Records. His second album, Sunset Man, was released in April 2008. It was produced by John Rich (of Big & Rich) and Jay DeMarcus (of Rascal Flatts), the latter of whom is Otto's brother-in-law. The lead-off single to Sunset Man, "Just Got Started Lovin' You", became Otto's first Number One hit, as well as the Number One country single of 2008 according to Billboard. James Otto was born on July 29, 1973, on the Fort Lewis Army Base in the state of Washington. He first took up singing at age two and later learned to play violin and saxophone. However, he wanted to learn to play guitar as well, and at age thirteen, he received a guitar for his birthday. He traveled throughout the country for most of his childhood, but his family finally settled in the small town of Benton City, Washington. After graduating from Kiona-Benton High School, Otto joined the United States Navy, where he served for two years. In 1998, he moved to Nashville, Tennessee, and began attending songwriters' nights there; three years later, he joined the MuzikMafia, a group of country music songwriters which includes Big & Rich and Gretchen Wilson. Otto married Amy Alderson in October 2005. Amy gave birth to their first child, Ava Katherine on August 24, 2010. In 2002, Otto met Scott Parker of Mercury Nashville Records, who signed him to a record deal that year. His first single, "The Ball", peaked at No. 45 on the Billboard country charts, while a second single, "Long Way Down", failed to chart at all. Due to the poor chart performance of these singles, Otto's debut album was delayed. "Days of Our Lives", his third release for the label, was released in late 2003, peaking at No. 33 on the country charts. Shortly after the song peaked, his debut album (also entitled Days of Our Lives) was released on Mercury, and in 2004, Otto was signed as an opening act for Shania Twain on her Up! Tour. His fourth single for Mercury, "Sunday Morning and Saturday Night", peaked at No. 58. After the song fell from the charts, Otto exited Mercury's roster. From there, he began working with the MuzikMafia, a gathering of singer-songwriters founded by Big & Rich, Gretchen Wilson and Cowboy Troy. Otto co-wrote songs and sang background vocals on two of Cowboy Troy's albums: Loco Motive and Black in the Saddle, released in 2005 and early 2007, respectively. By mid-2007, Otto signed to Warner Bros. Records Nashville. His first single for the label, "Just Got Started Lovin' You", was released at the end of that year as the lead-off single to his second album, Sunset Man. The album was co-produced by Otto's brother-in-law, Jay DeMarcus of Rascal Flatts, along with Big & Rich's John Rich. Sunset Man peaked at No. 2 on Top Country Albums upon its April release. "Just Got Started Lovin' You" reached Number One on the Hot Country Songs charts a month later, becoming the highest-charting single of his career as well as the Number One country single of 2008 according to the Billboard Year-End charts. The album's other two singles — "For You" and "These Are the Good Ole Days" — did not perform as well on the charts, peaking at No. 39 and No. 36 in September 2008 and March 2009, respectively. In mid-2008, Otto was commissioned to perform a new theme song for the Atlanta Braves, entitled "The Braves Play Here," composed by Greg Barnhill and Randy Wachtler for 615 Music. He also co-wrote Jamey Johnson's mid-2008 single "In Color" with Johnson and Lee Thomas Miller. This song was nominated for a Grammy Award for Best Country Song at the 2008 Grammy Awards, and received the 2008 Academy of Country Music award for Song of the Year, which is awarded to the songwriters. Otto released a new single, "Since You Brought It Up", in April 2009. It peaked at number 37, and did not appear on a studio album. The song was followed by "Groovy Little Summer Song" in early 2010. It reached the Top 30 and served as the lead-off single from Otto's third album, Shake What God Gave Ya, which was produced by Paul Worley and was released on September 14, 2010. 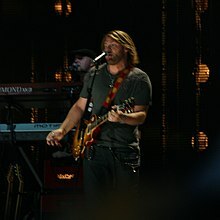 The album's second single, "Soldiers & Jesus," was released to country radio on September 7, 2010, and reached a peak of number 34. In March 2011, Otto announced on his Twitter that he had exited Warner Bros. Records. Otto also performed backing vocals on the original album cut of the song "Chicken & Biscuits", performed by country rap artist Colt Ford on his 2010 album of the same name. The single version, however, features Rhean Boyer of Carolina Rain in place of Otto singing on backup. Otto also co-wrote Zac Brown Band's 2012 single "No Hurry". "Sunday Morning and Saturday Night"
"Just Got Started Lovin' You"
"These Are the Good Ole Days"
"Since You Brought It Up"
^ a b c d e Leggett, Steve. "James Otto biography". Allmusic. Retrieved 2007-07-24. ^ "James Otto Welcomes Daughter Ava Katherine – Moms & Babies – Moms & Babies - People.com". Celebritybabies.people.com. 2010-08-23. Retrieved 2012-03-26. ^ "Despite his ballads, James Otto wants to rock". CMT.com. Retrieved 2007-07-24. ^ "James Otto: Putting the Pieces Together". Country Weekly (web exclusive). 2008-03-24. Archived from the original on 2008-04-01. Retrieved 2008-04-09. ^ Morris, Edward (2008-05-10). "At Last, James Otto Scores No. 1 Song". CMT.com. Retrieved 2008-05-14. ^ Miller, Doug (2008-05-20). "A new voice for the Braves". Major League Baseball. Retrieved 2008-05-21. ^ Wyland, Sarah (3 March 2011). "James Otto & Warner Bros. Nashville Part Ways". Great American Country. Retrieved 4 March 2011. ^ "James Otto Inks Deal With Blaster Records". Allaccess. 8 June 2015. Retrieved 11 June 2015. ^ "James Otto Album & Song Chart History (Country Albums)". Billboard. Retrieved August 27, 2010. ^ "James Otto Album & Song Chart History (Billboard 200)". Billboard. Retrieved August 27, 2010. ^ "James Otto Album & Song Chart (Country Songs)". Billboard. Retrieved August 27, 2010. ^ "James Otto Album & Song Chart (Country Airplay)". Billboard. Retrieved August 31, 2015. ^ "James Otto Album & Song Chart (Hot 100)". Billboard. Retrieved August 27, 2010. ^ "James Otto Album & Song Chart (Canadian Hot 100)". Billboard. Retrieved August 27, 2010. ^ "RIAA - Gold & Platinum - August 27, 2010: James Otto certified singles". Recording Industry Association of America. Retrieved August 27, 2010. This page was last edited on 17 December 2018, at 01:08 (UTC).